The world of pipeline management and maintenance is rapidly changing. driven by ever-increasing competitive pressures to reduce/optimise the major OPEX cost factors. From a process automation point of view, this demands utilising new IT technologies to deliver these cost savings. While these new technologies bring interesting improvements, each one requires more to learn and manage. A lot is expected from solutions that contribute to increased efficiency and reduction of waste and energy consumption. In applications where facilities are distributed over large geographical areas—sometimes in very severe climate conditions—a lot can be achieved by better utilisation of expertise and knowledge and high level of automation to minimise human resources across local and remote production facilities. This will, at the same time, also contribute to waste and energy reductions in particular by establishing faster and better information sharing across domains of expertise to make well informed decisions in real-time. Most of such applications can be found in those related to the energy supply chain (i.e. transport pipelines, oil and gas productions, terminals, and renewable energy like wind and solar. etc.). Significant contributions can be delivered by tailored collaboration environments, which can bring operational, maintenance and business information sources together in an integrated visualisation and data collection environment. This means that data from different sources needs to be interrelated and translated into key performance indicators' of the most elementary operational and business functions. From these KPls, it must be possible to target individual conditions and view their contribution and relation with the information and data they are derived from. A pre-requisite to facilitate this integrated visualisation is a flexible and platform independent environment to build the applications for remote operations as well as being capable to integrate information from sources other than primary process data, such as CCTV systems, web-sources (internet/intranet), and internal documents. This integrated visualisation then needs to represent this information as naturally as possible. Fast deployment and development can be achieved by standard components/elements that can build up the dashboard visualisation environment. The latest web technologies are very powerful to bring these technologies to end users whether they engage at a central decision support centre or through a collaboration network of smart mobile devices (smart phones, tablet PCs, etc.). This concept is, to a large extent, in line with what is expected as delivering essential information from concurrent sophisticated pipeline management systems (which include SCADA, leak detection and allocation, corrosion monitoring (i.e., PHMSA), graphical information and manufacturing execution systems) shared to specific enterprise groups by means of pre-defined reports. However, the difference is in speed of information and interaction moving from a transactional process to 'real-time' interaction and intervention from a decision support or collaboration network acting as an enterprise information monitoring system. State-of-the-art collaboration centres can, in this way, facilitate a holistic view over all the key aspects of pipeline operations. Collaboration centres are utilised to overlook one or many pipelines and grid network systems. The aim is delivering better and cross-related information to show compliancy and impact on environmental factors as well as to show impact on business performance factors. For instance, monitoring results in reduction of energy and waste represented as energy efficiency, carbon footprint/credits and direct cost savings. Furthermore, collaboration centres should be able, to some extent, to provide more details on the issues that directly negatively impact these key performance indicators. For instance, showing physical conditions of assets and their direct environment by means of integrated, and easy to navigate and control webcam views or local weather station sources that can show and predict (animate) rain/snow fall and temperatures from actual to couple hours or days ahead. Another important aspect is that contribution collaboration centres can deliver in optimising the efficiency of resources by facilitating the move from local to more centralised (remote) operations and 'real-time' information sharing. The aim is to minimise human resources across local and remote production facilities and to centralise knowledge for more effective and consistent use. This is, of course, not limited to only an operational point of view but also applies to the maintainability of collaboration centres and pipeline management systems. The platform should preferably be the same for both and be able to support centralised engineering, deployment, license and revision management as well. SCADA, in these applications, already holds a key role in the collection of field information and exchange of data with other applications and/or enterprise systems. Therefore, pipeline management systems that incorporate the latest web-based and platform independent IT technologies can be most effectively utilised as a collaboration centre platform. Figure 1. Yokogawa's collaboration centre. 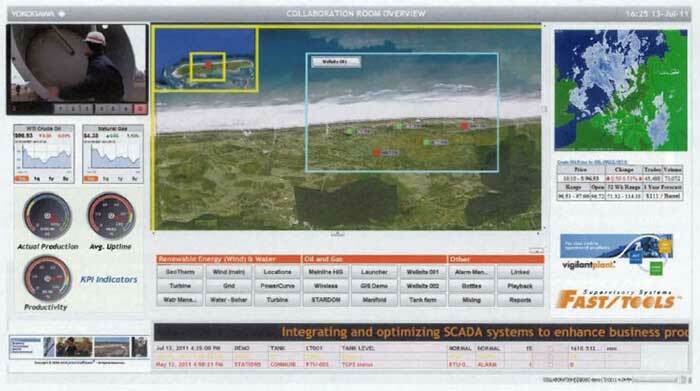 In April, Yokogawa announced the release of the FAST/ TOOLS version R9.04 web-based SCADA system, which brings more than 30 years of real-time innovation to the oil and gas, petrochemical, and power industries. It is providing users with a new and innovative method of remote engineering and maintenance, deploying process applications and real-time management of these via secure web-based services, therefore increasing overall equipment effectiveness (OEE) and return on assets (ROA). Combining the systems that businesses already rely on with the latest technology solutions, this web-enabled software, allows those businesses to secure previously made investments. With the proliferation of our decision support and collaboration centres, data from a variety of sources can now be accessed and shared globally, allowing continuous application development and management. Functions to facilitate these requirements are available with these new supported technologies. This will increase management efficiency through the continuous availability of process and maintenance information from all sources with an expected reduction in cycle time and a reduction in the need for the exchange of paper documents. As mentioned, this requires special applications to go beyond traditional HMVSCADA related environments. The saying that pictures say more than a thousand words drove the development of a comprehensive real-time operation recording facility. Functioning much like a flight recorder, this enables the synchronised playback of screens with alarms and events as well as process and trend data, and includes all mouse movements and relevant keyboard strokes. The recorded video data can be used for cause-and-effect analysis, operator training, and simulation to increase overall safety, security, and regulatory compliance. This adds a significant new dimension to the capabilities to complement audit trailing and diagnostics functions. As an addition to its standard EEMUA-191 compliant alarm management functionality, alarm notification messages can be emailed to certain subscribed users per specified areas and destinations. This call-out function makes it easy to define when, where and to whom notifications should be sent. The alarm management function now also enables the export of aiStrm and event notifications to programmes such as MS-Excel for alarm analysis. Of course, a web-based server and client architecture requires easy remote access, but also deployment of security enhancements in compliance with company security policies and in accordance with corporate IT directives. To enhance and incorporate security, this system and its applications are hardened to protect against failures and prevent unauthorised access and use. At the same time, simple licensing policies can make it easier than ever to reduce costs through web-based engineering and virtualisation.